John 14:2 says’, “In my Father’s house there are many rooms if it were not so, I would not have told you.” In the same way I believe at Holy Family we prepare rooms for our entire community and by inviting them in we Make God Visible. So how do we make God’s presence a reality? I think God’s presence becomes real when we are welcoming and invitational. This is achieved by making people feel special through listening and also giving them the opportunity to contribute to our community. Our willingness to listen is evident through an acceptance of their diversity and allowing them to showcase their creativity through culture, the arts and their different customs. I believe that is through creativity we learn not only about cultures but about their stories and symbols that give meaning and purpose to their lives. At Holy Family where we stewards over the Earth and celebrate our Catholic Identity. Everything you have wanted to know about Objects in the Church. In Yesterday’s Sacramental Class Father Roderick explained all the Materials and Objects in the Church. Here is a quick summary of the different objects and there purpose in the Church. The Altar – The altar is a symbol of Christ himself. It represents both the sacrifice Jesus gave of himself on the Cross, and the meal which gives us spiritual nourishment. Before Mass begins a white altar cloth is placed on the altar. A smaller cloth with colour defined by the liturgical celebration may be placed underneath relating to the Liturgical season. Two candles are placed on the altar reminding us Jesus is the light of the world. A cross may be processed in by a server at the beginning of Mass, or simply be positioned near the altar before Mass. The sacramentary (priest’s red missal) should be left on his chair, or if there are altar servers on one of their chairs. During the offertory the gifts of bread and wine are processed in and the priest will place on the altar. The Side table – a white cloth covers this table. The chalice is placed on this table – on top of the chalice is a white purifier, and on top of the purifier is placed the pall, a square piece of cardboard covered in white cloth. The corporal is later opened and placed on the altar to identify the place where the bread and wine are consecrated and become the Lord’s body and blood. It has the purpose of gathering together any crumbs or fragments from the hosts when they are broken. There needs to be a bowl of water for the priest to wash his fingers, and a small finger towel. The Lectern is the stand where lectionary is placed, and the readings and especially the Gospel are proclaimed. Strictly speaking the Penitential Rite and Prayers of the Faithful should be read from another place, but sometimes the lectern is used because it has a microphone. Paten with small Eucharistic bread placed on it covered by a large Eucharistic Bread which are to be consecrated body. Cruets of water and wine which are to be consecrated into Christ’s Blood. The back table’s purpose is designed for the Gospel Procession and Procession of Gifts. Gospel Procession-Lectionary opened to Gospel Reading & 2 Candles lit. Lectionary- We use the Children’s Lectionary and it contains the Book of Bible Readings. For Mass we use the readings of the day taken from the ordo & look them up in the back of the children’s lectionary. Cruets of water and wine which are to be consecrated into Christ’s Blood. At the Lamb of God goes to the Sacristy -the room where materials & vestments are stored for mass. Tabernacle- where consecrated hosts are kept for communion brings up the Ciborium -the vessel that holds the consecrated hosts which are given at communion and the remaining ones reserved after communion. Why have a Prayer Table? 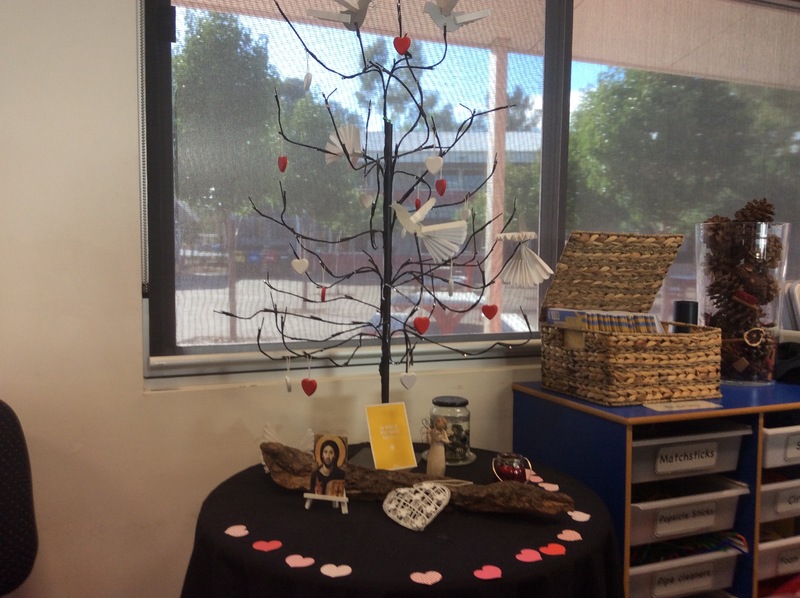 I believe a prayer table in a classroom represents a sacred space where God invites us into a relationship through prayer. Symbols that make up a prayer table. The Sign of the Cross is a symbol of Trinity the three persons that make up one God. A cross symbolizes the sacrifice Jesus made through his death on the cross. A cloth with colour defined by the liturgical celebration is placed underneath. Candles are placed on the altar reminding us Jesus is the light of the world. The Bible is the Sacred Scripture where we learn how to live our lives according to the traditions and stories of the old and new testament. Modelled by the miracles and teachings of Jesus who exemplified the power of God’s presence in our lives. We can also praise and thank God by decorating our table with our own symbols whether they are from nature or artwork that has been done in class. Prayer tables God’s special place in our class. 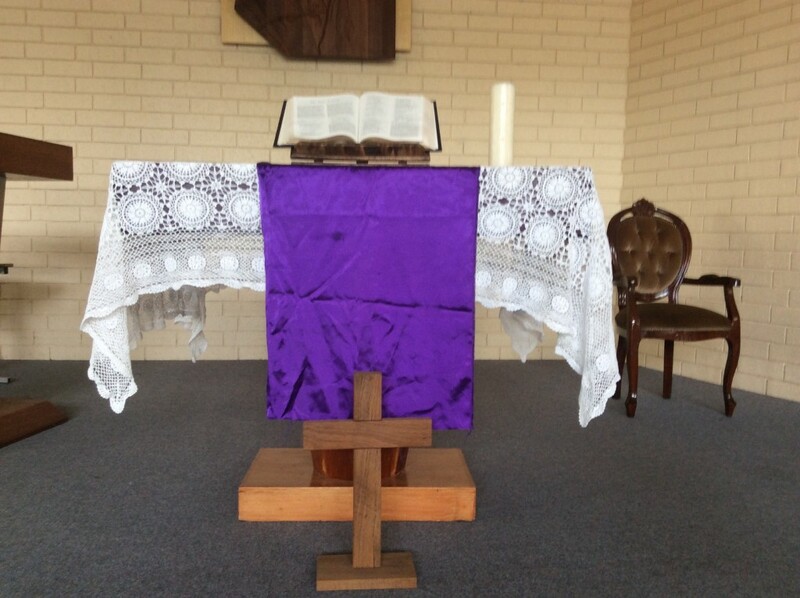 Vestments of purple or violet are used during Lent or Advent. Is the colour of growth, life and hope. It is worn during ordinary time. Pentecost Sunday, and for celebrations of the Sacrament of Confirmation. It is also the colour that has traditionally been associated with martyrs those who have shed their blood for their faith and so it is worn on the feast days of martyrs. Rose is an optional colour that may be used on the Third Sunday of Advent and the Fourth Sunday of Lent. On both of these days, the Entrance Antiphon calls us to rejoice, so the rose vestments mark a softening of the penitential tone of the season. 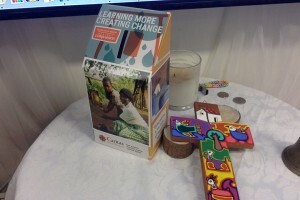 Caritas Australia is the official agency for overseas aid and development. It has funded emergency relief and long term development projects in more than 50 countries throughout the world. It is the nation’s largest fundraiser providing water and medicines for poor countries. Lent gives us the opportunity to think outside ourselves and share what we have with those less fortunate. 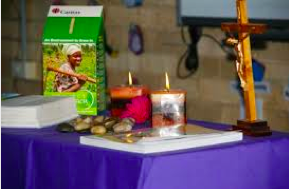 Caritas is a Latin word meaning ‘love and compassion.’ By being involved in Project Compassion that is one way of them expressing their generosity during Lent. Learning creates opportunities for long term positive change. Project Compassion 2016 celebrates the power of learning, and the many ways in which Caritas Australia is working with local partners around the world to provide vital learning and renewed hope to children, women and men most vulnerable to extreme poverty and injustice. Through education, training and sharing knowledge, individuals and communities are empowered to transform their futures and create lasting change. 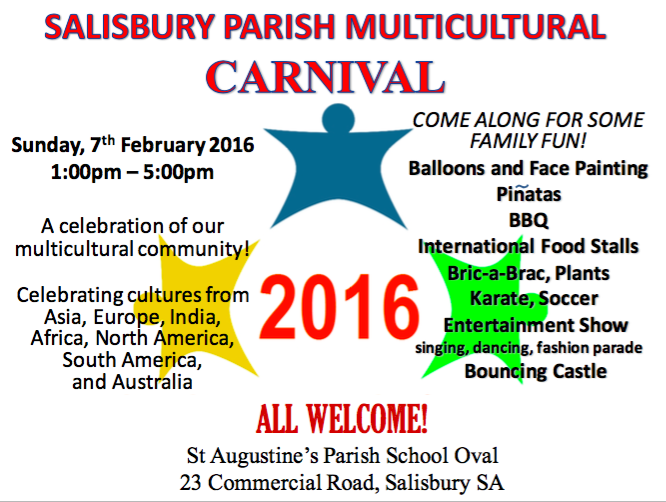 On February 7th at Saint Augustine’s School Oval, Salisbury the Saint Augustine’s Parish celebrated the Parish Carnival. 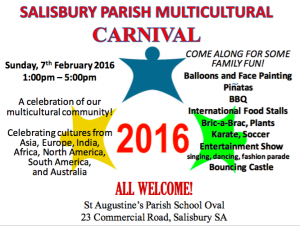 It was a celebration of our multicultural community! 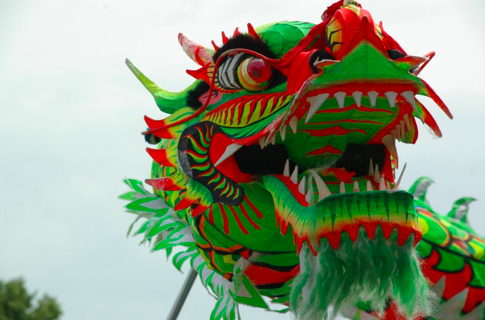 Celebrating cultures from Asia, Europe, India, Africa, North America, South America, and Australia. singing, dancing, fashion parade and even a Bouncing Castle. Holy Family, Saint Augustine’s and Thomas More College. What was particularly significant was the the different parish committees and groups contributing to the day. The different prayer groups, as well as those who serve our community, St Vincent De Paul Society, Knights of the Southern Cross and the YCW, Young Christian Workers. 11 You will be enriched in every way so that you can be generous on every occasion, and through us your generosity will result in thanksgiving to God. 12This service that you perform is not only supplying the needs of the Lord’s people but is also overflowing in many expressions of thanks to God. In the Year of Mercy, the Pope Francis is challenging us to act with kindness and generosity towards other people and our environment and that everyone has the power to undertake this goal. I believe there are three components to mercy. I will illustrate these components through a story. 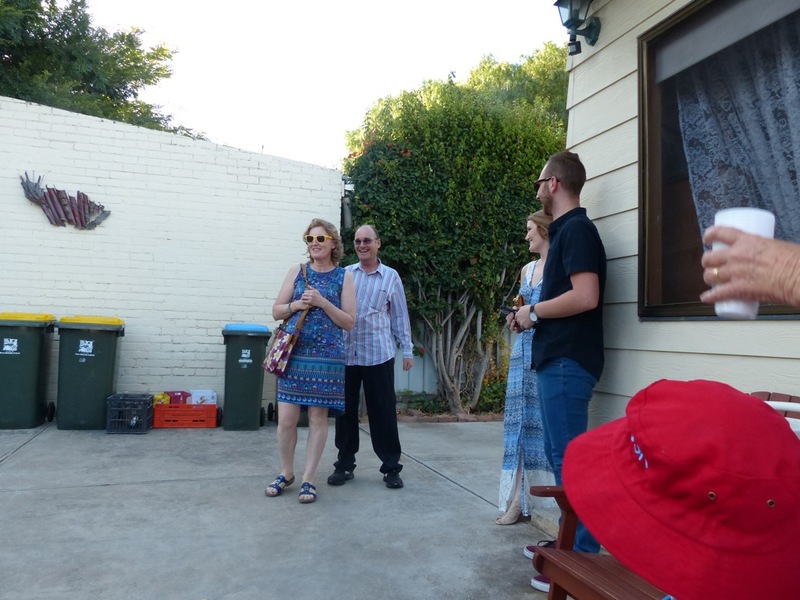 Now it was my wife and my Thirtieth Anniversary and just when I was about to make plans, my daughter had arranged for us a meal one night and a stay in a Barossa Valley Hotel the next night. Although not really complementing my plans I was happy to go with the flow rather than create possible tensions. in-laws will also be joining us for the dinner and we would have to go. My wife and I walked along the driveway. As we turned the corner, we saw one hundred family and friends staring at me and my wife, wishing us a happy anniversary. When I relayed that story a few days later to a friend of mine, who taught my daughter, he said that act came from the heart. Hence the first component of Mercy is that a kind act comes from the heart. Additionally, my wife told me later that when her dad saw us he had tears in his eyes. I reflected that the reason why he was filled with emotion was because he was with family who had travelled from different parts of Australia to celebrate with us. Thus, I believe the second component of Mercy is that it touches others who in turn are inspired to perform a kind act. Finally, the third component of Mercy I believe is that you need to have courage. My daughter had a logistical nightmare in organising the venue, catering and inviting the guests from all around Australia. However, when people declined her invitation or placed organisational obstacles in her way she overcame the challenges and kept focussed on making the celebration successful. So I believe that Mercy demonstrated by an act of Kindness comes from the heart, is inspirational and courageous perfect for continuing Christ’s mission. 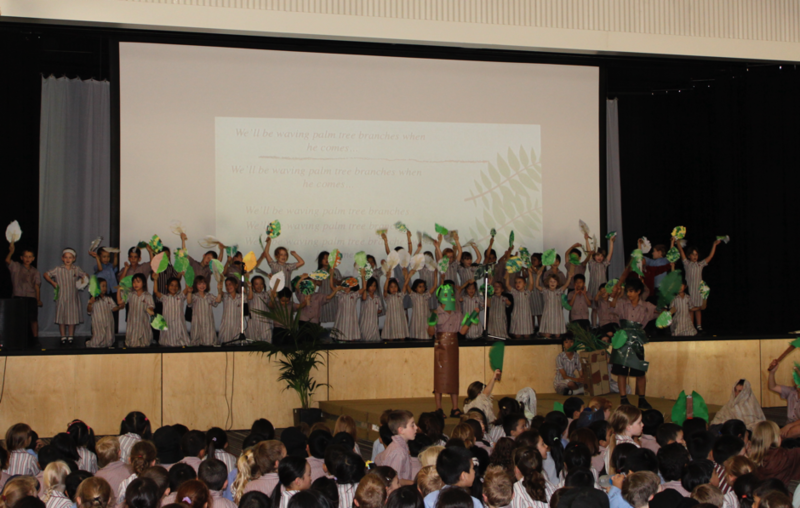 At the start of the year was our beginning of the year assembly. From our Welcome, the Kaurna Acknowledgement, the National Anthem, the Pope’s Mercy Prayer, the announcing of our leaders and new teachers to the presentation of the Lunar New Year was a great showcase of Holy Family ‘s cultural diversity. I believe diversity was God’s plan for each one of us. Not only in our physical appearance but in the way we think. I often think that if God’s image wasn’t diverse then we would all look and think the same. For I believe that it is in diversity that we learn about different cultures, foods, languages, arts and sports. Most importantly we appreciate the beauty and creativity of God in every person we meet and in the environment we live in..
Today we celebrated Ash Wednesday has a whole school in the Saint John Paul 11 Hall. A theme which challenges us in the way we think and interact with others. Father Shibu stated in his homily to succeed in this challenge we must Pray, Fast and Share. In my Prayer I reflect on my daily life and where I have allowed God to be a part of words and actions. I contemplate about where I have empowered others and also what changes I could make and also where I may be of greater assistance. Fasting I define as do my words and actions serve only my purpose or does that give greater meaning and purpose to others lives? Furthermore, are there inhibitors in what I do and say that hold me back from successfully engaging myself and others in achieving our goals. Finally, Sharing do I only give only what I want to contribute or am I courageous enough to take risks and accept losing out along the way? I believe in high risk high reward and and if I limit my outcomes I won’t achieve as much as I could. Hence, the only person losing out is me. ‘When did we give you something to eat or drink? Praying, Fasting and Sharing leads to changing not only mine but hopefully the livesof those I encounter.